The challenge over at Just Add Ink this week is Just Add Males. Ugh, masculine cards often have me in a tizz. They're generally not to be pretty and pink, with lace and ribbon! However, I knew exactly what I wanted to create this week and I'm quite happy with my masculine creation. With Father's Day just around the corner, I wanted to acknowledge my amazing, fabulous husband....who seriously does ROCK! He is also pretty 'sharp' on the guitar too....pardon the pun! 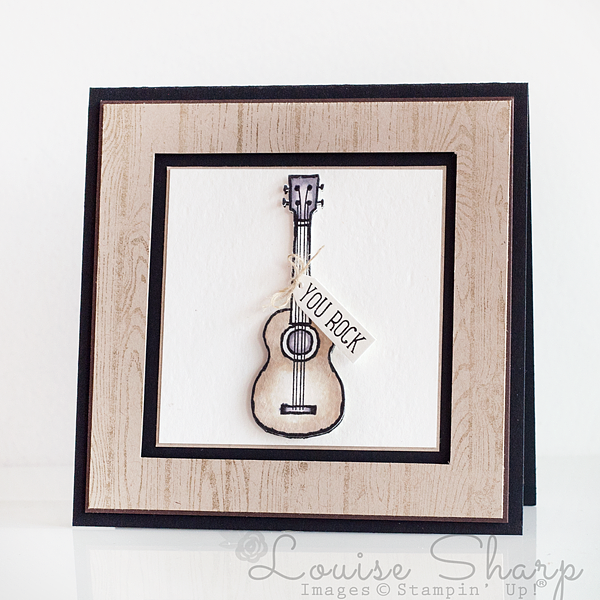 I used the guitar and sentiment from the 'Skating By' stamp set. I'm not sure if you can tell from the above photo, but the timber frame has been made with a square cut out and the layer inset into it....I hope I'm making sense!? Want some more masculine inspiration? Oh that sounds really bad doesn't it?!! Sorry, I'm not sending you off to a site filled with Brad Pitt, George Clooney or Channing Tatum! 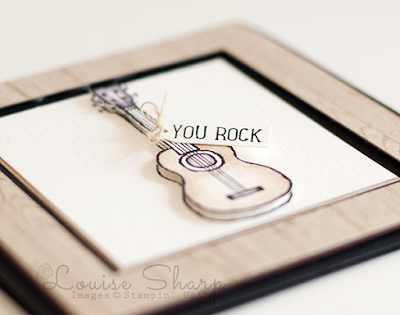 Even better....masculine cards created by the amazingly talented Design Team over at Just Add Ink. I could not love this card more than I do. This is beautifully designed and artistically crafted, Louise. AND...and....and...this is a stamp set that has never made its way on to my "want" list (insert deflated sound) until now. This is a stunning card from a silly set. Did I mention I love it? Wow! Go Louise! You are so smart. I would never have thought to use this stamp set like this. How talented are you? I'm in awe.